We have finished the first half of second term. Mid-Terms have been checked and returned, and all-in-all, I'd say things are going well. Already, in the new curriculum, I've had to change a few of the readings, but I'm now able to look ahead and anticipate a little better which articles or readings will be troublesome and quickly replace them before we get there. Overall, the scores on the mid-terms were very good. There still seems to be a wide divide, though, between the different levels of students. Some students, however, have surprised me with how much they prepared for this exam. Very few students, in my opinion, performed below their ability. I'll have to reassess the vocabulary sections on the exams. Too easy. I think it's a mistake NOT to reword the meanings. I'm not entirely sure that, in matching words and meanings, the students are REALLY being tested as to whether they KNOW the word, or whether they have merely learned to look for a specifically shaped or spelled keyword in the definition, thus allowing them to match a word and a meaning without really understanding either one. I'll have to address this in future tests. First, I bought a couple new books and received a sample book from Oxford with their latest catalog so we have three new books in our library. 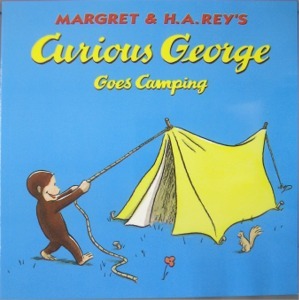 I had this book when I was a child. I enjoyed it then, and it's still enjoyable today! 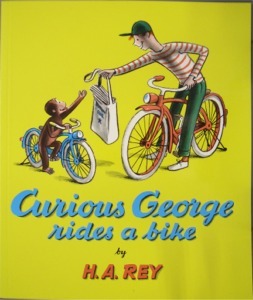 A strong case can be made that these aren't age-appropriate for junior high students, but the students requested more Curious George, so I obliged. This is perhaps too high a level, both in language and maturity for junior high, but we also share the NELP library with the Life Science Course students, and I think THEY'LL be interested. It's sometimes difficult to get 'normal' pictures of my third grade class because they're always doing something funny. This isn't even the funniest picture from third grade this week, but I swore I wouldn't post the others. I'm happy to report that the third grade class now has eight students. One of our students came back to Seishin after more than a year in Europe, and we are all really glad she's back. The first graders just finished their mid-term projects. The students had to research a person, place, thing or event from history, write an essay and make a presentation about it. This student did a superb presentation about King Tut: specifically, theories about the death of King Tut and the possibility of a conspiracy! Very cool. The students all did a lot of research. We had presentations on: the history of cell phones, King Tut, Agatha Christie, the domestication of dogs, Adolf Hitler, Florence Nightingale and the differences between European and Asian dragons! Here, students are doing research for their essays and presentations about dragons and Agatha Christie..
A rare picture of me, taken by my third graders. The first graders are continuing work on the newsletter, including their column about my different neckties. They are also doing research for a column on festivals. And another column on recipes. And here is more artwork for the column on interesting books in the library. Finally, here is a picture of a student during reading class. Which actually brings me to my next point. 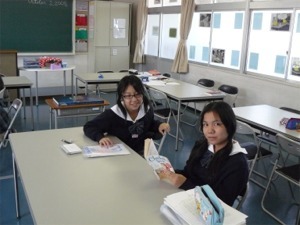 Recently, our school was visited by teachers from cram schools, who wanted to see what was going on, etc. A couple of teachers who passed by the NELP room were a little puzzled because the class looked very different from what they had seen in the past: apparently, not much was going on, and it looked quite casual. I think this deserves an explanation: it was reading day. On reading day, students are expected to independently get books, read books, and talk about their books. It's a little difficult, as you can imagine, to keep students on that task for 45 minutes. When the idea of devoting my valuable class time to in-class reading was first suggested to me by one of the advisers to the NELP program, a professor at Seishin University, I was quick to dismiss it. I felt that reading was something students could do outside of class and I saw no reason to give up my teaching time to something that was better done outside of class on the student's clock. However, my adviser asked me to give it a try, and I'm not sorry that I did. Reading has increased exponentially. Although it may look like not a lot is going on, there's more to reading time than meets the eye. The students have been doing very well at recommending books to one another, encouraging one another in their reading, and in helping one another with improving the quality of their book reports, and by extension, the reading experience. I highly recommend in-class reading. I have discovered that, contrary to my initial dismissal, it is not a waste of time at all. This week, a lot has been going on. 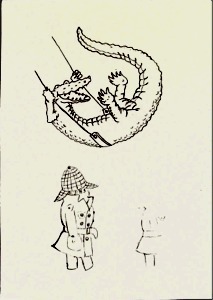 The first grade studied about fashions in the 17th to 19th century. The second grade studied about trading between enemies during the US Civil War. The third grade studied about the Mausoleum of Theodoric. In our reading classes, there has been a lot more discussion going on. Here, the third grade students are discussing their outside reading books in our Thursday reading class. Here, the first grade students are discussing their writing. This is my board work for my first grade writing class, wherein I talked again about the importance of brainstorming and following the writing process. In reading class, the first graders worked in groups on a paraphrasing exercise. Here, the second grade students are discussing topics related to our reading. Here, the high school first grade NELP class is getting reading to give presentations about entertainment. Two students taught us a dance. One student taught us to cut out interesting paper flowers, and the last demonstrated her ability to make a 'bridge' by bending backwards and putting her hands on the floor. Here, the junior high first graders are doing research for the articles that they would like to put into our class newsletters. Two students are working on an article about festivals. Three students are working on an article showcasing recipes, and two students are writing an article about interesting books. Here, students are copying art from the covers of the books they are writing about. 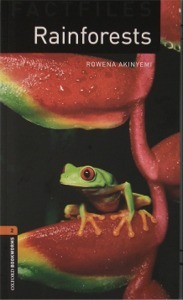 And here is one of the book covers they decided not to use, but which I think was still very cute. The students are also doing a column about my ties. The third grade students had a little fun in class drawing pictures of me on the board during a drawing game. In other news, I redecorated my classroom, and this time I put up a series of motivational quotes. This one is my favorite, and I read it to all of my students. In case in doesn't come out well enough to read, it says: I am always doing that which I cannot do in order to learn how to do it. Pablo Picasso. 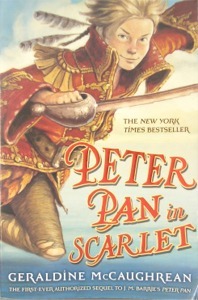 Finally, we have a new book for the library: Peter Pan in Scarlet. I hope the students will enjoy it as much as I did. * In first grade, we'll be studying about Social Anxiety Disorder. * In second grade, we'll be studying about the recent crisis of rising food prices and its effects on the third world. * In third, we'll be studying about the recent change in focus of the American education system. These will be the last readings for the students before the mid-term. Monday, I hope to give out the mid-term review sheets. I've consolidated and shortened their vocabulary lists, printed the texts of the readings that will be on the test, and included a vocabulary list explaining the difficult vocabulary on each reading.